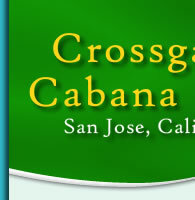 ​Crossgates Swim Club is a homeowners association comprising 157 homes in the Almaden Valley region of San Jose, California. Crossgates was founded in 1966 and since has established itself as one of the most family-friendly neighborhoods in San Jose. We are the proud home of the Crossgates Gators Swim Team! We are no longer accepting applications for associate membership for 2019. We will be accepting applications for the 2020 season beginning November 1, 2019. Fri: 4 p.m. to 9 p.m. Sat: 1 p.m. to 9 p.m.
Fri: 1 p.m. to 9 p.m.
Thu: 4 p.m. to 8 p.m.
Sun: 1 p.m. to 8 p.m.
* Note, the Sunday before Memorial Day, the pool will be open until 9 p.m.
** Note, the Wednesday before Independence Day, the pool will be open until 9 p.m.
*** Note, the Saturday and Sunday before Labor Day, the pool will be open until 9 p.m.
Below are the current Adult Swim Hours, as of Mar. 20, 2019. Fri: 5:45 a.m. to 10:30 a.m.
Mon–Fri: 5:45 a.m. to 3:30 p.m.
Thu: 5:45 a.m. to 10:30 a.m.
Mon–Fri: 12:00 noon to 1 p.m.
Mon–Fri: 5:45 a.m. to 1 p.m. Adult Swim Hours for the remainder of 2019 will be discussed at a future Board meeting.